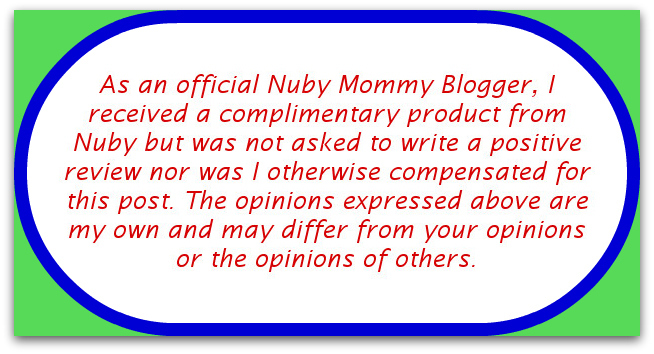 As an official Nuby Mommy Blogger, I have another fun Nuby product to share with you! Nuby Sound Bite weaning spoons make feeding more enjoyable for babies and their parents. The spoons are flexible and soft at the end to be gentle on sore baby gums. 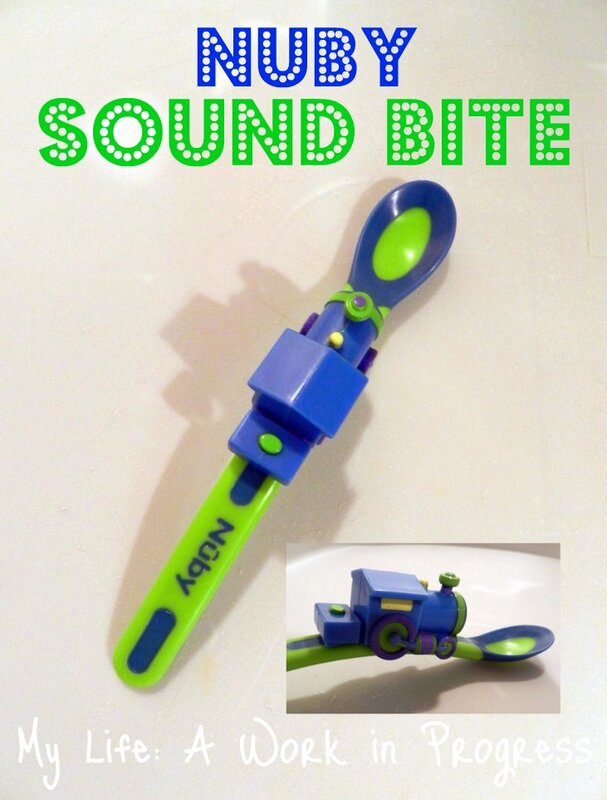 A set of two weaning spoons comes with one sound bite- either a train, a car, or an airplane that makes the appropriate noise at the press of a button. The sound bite slides off the spoons easily, making dishwashing a breeze. The first thing I noticed was that the spoon handles are a little wider than the other brands of baby spoons we own. I actually liked this, and felt I had a more stable grip on the spoon. The stability is important when Baby J is trying to wrestle the spoon or knock it out of my hand. How the wideness will affect my son when he starts feeding himself, I don’t know. I’m holding off on that until his motor skills have developed more- I don’t need extra messes to clean up right now! The bowl part of the spoon is wider and deeper than other brands I’ve tried. This is also something I now prefer. My son is more than capable of larger bites, and the spoon gives him that. With or without the train, I’m finding myself reaching for these spoons more often than my others, because of the fit. I find the spoons easy to clean; I just slide the train off and pop the spoon in the dishwasher. Baby J is fascinated by the train, and I think it’s a vast improvement on the plane and train sounds my daddy used to make while feeding us kids! Watch the video below to hear and see the Sound Bite in action. Baby J wasn’t thrilled with the purple surprise I was feeding him, but he loves the train! Also, I’m not usually that messy when feeding him, but I’m not coordinated enough to feed him cleanly and operate my cellphone video camera! 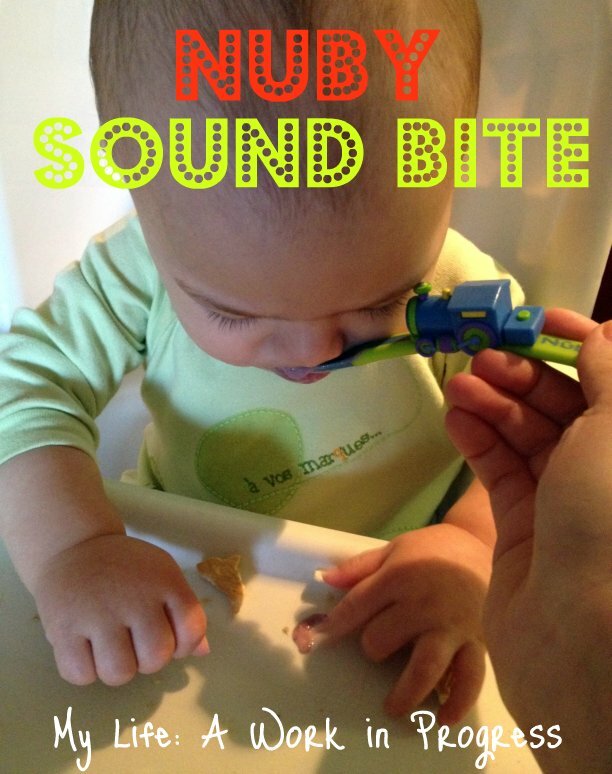 You can find the Sound Bite Weaning Spoons at Best Baby Gear. They’re on sale right now! For updates on new Nuby products, follow them on their social media accounts listed below. They have several giveaways running right now for just a few more days, so make sure to visit them on Facebook. Or view my Nuby giveaway list. Is your little one eating solids or starting soon? Read my review and cleaning tips for the Nuby Nibbler! Is bath time being a bore? Check out the adorable Tub Time Turtle! Sleep training update: We’re seeing progress! This spoon is adorable! Thanks for the review! Hahha that is too cute. At first I thought it sounded like a t-rex and I was like what is that.. then I realized it was the spoon! So cute and very creative of them! Cute spoon. Fortunately with my daughter, she has been happy eating off one of our regular spoons without any problems. What a great way to get baby to actually enjoy eating! I love that! i wish i had had that when mine were younger! They’re so cute, and I bet the little ones think they’re fun! Aw, that’s so cute! I’ll bet my daughter would love this! Great review! This is such a cool spoon. I think my daughter would love it! So….Grandma put one of these in the Easter Basket for the Itty Bitty! Thrilled that it sounds like she will enjoy it 🙂 Loving these Nuby reviews!!! Oh great! Was it the train sound bite? I’m curious to hear the plane bite, because my dad used to make the plane sound when we were kids. I want to compare, haha!